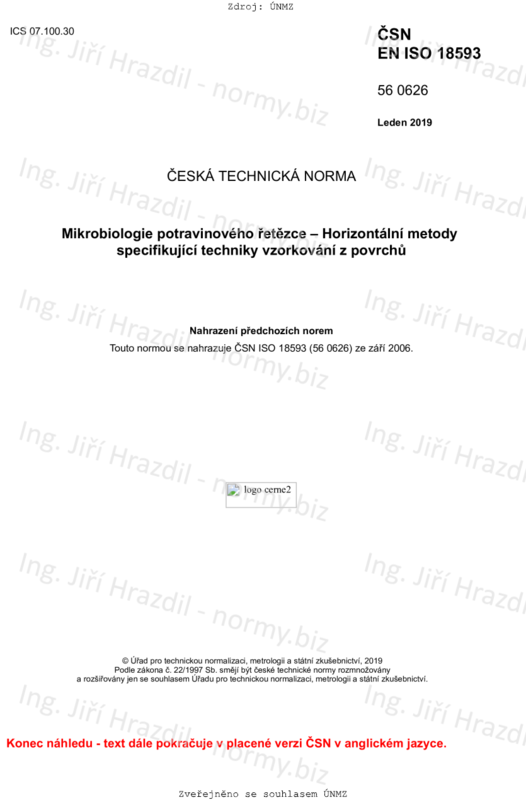 This document specifies horizontal methods for sampling techniques using contact plates, stick swabs, sponges and cloths on surfaces in the food chain environment in order to detect and enumerate culturable microorganisms such as pathogenic or non-pathogenic bacteria or yeasts and moulds. NOTE: The term "environment" means any item in contact with the food product or likely to represent a contamination or recontamination source; for example, material, premises or operators. This document does not apply to the validation of cleaning and disinfection procedures. This document does not apply to sampling techniques for primary production samples, which are covered by ISO 13307. Sampling techniques for carcasses are covered by ISO 17604. Sampling techniques for analysis of noroviruses and hepatitis A viruses are covered by ISO 15216-1. This document does not give advice on sampling frequency, the number of sampling points, or the need to rotate sampling points, as these are chosen on a case-by-case basis.